Cover art for Munchkin Cthulhu. Credit: Steve Jackson Games. When will people start listening to the Herald of Bob? I argue. I reason. I yell. I shout. But no one, not a single blessed soul, every fully understands that Bob is the real enemy. And that if he’s doing something that looks like it’s going to help you, that means he’s about to win. Or setting up a win in three moves. He is, by no means, actually helping you. And he is the real enemy. Such was the case Friday night when — in honor of of the 8th anniversary of Steve Jackson’s Munckin — we combined my Star Munckin, Star Munckin 2 and Munchkin Cthulhu sets to create a truly epic space/horror mashup that will forever be known as … Star Spawn Munckin. It was a surprisingly effective combination, leading to feline cultists, mutant investigators, and bounty hunter bugs battling against clown troopers, geek ones, and various forms of shoggoth. It also saw our single best Munckin moment ever. I’ll let Bob retell it (from a post in our group forum); I couldn’t do the episode justice. Now Ken, Jon and I are all Cultists. 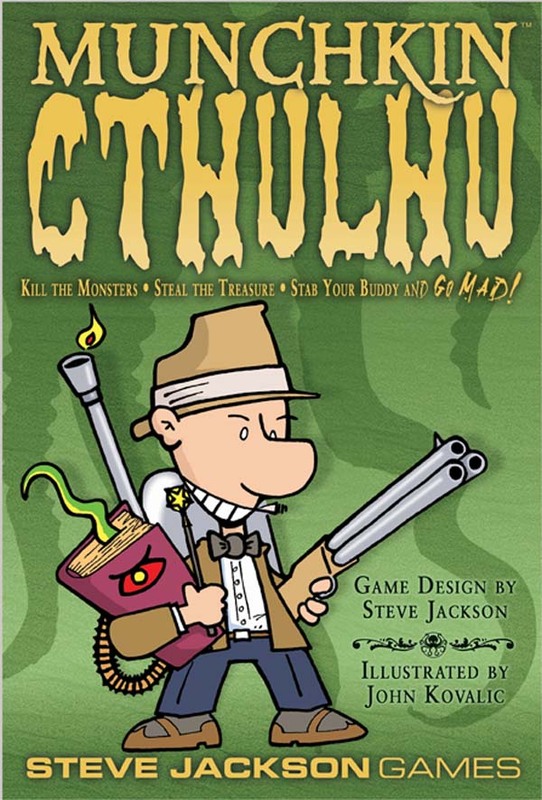 According to the Munchkin-thulu rules if all players become Cultists the game immediately ends and the highest level player wins. Damon is the only non-cultist. For several turns, all four of us have been picking up +10 to monster, +5 to monster, and wandering monster cards. So everyone knows that even lvl 1 monsters are going to be tough. It gets to my turn. I kick in the door and don’t get a monster. PERFECT! I choose to fight a monster out of my hand. Normally at this point that would be pretty dangerous because of all of the monster buff cards that everyone has recently picked up. That’s what I’m counting on. I play an 8th lvl monster, The Awful Green Thing (from my favorite Steve Jackson game EVER!!). Again, it is the perfect bait. It’s 8th level, causes a -1 to run away checks, bad stuff is loose 2 levels (and headgear, i think) and it has 2 treasures. When I play it, I play a few one-use bonus cards so that I’m beating it by 11, since I anticipate that someone is going to play a +10 lvl on the monster. Jon plays the +10 to monster level. I’m still beating it by one though so Jon or Ken play another monster buff, giving it 3 more levels. So I’m loosing, but the monster is now worth 4 treasures. PERFECT! Ken energetically reminds everyone that I’m The Real Enemy and strongly urges Damon not to help me. However, Damon is the same level as I am but already has more and better items than I do AND his class ability (bounty hunter) allows him to pick up a door card when he helps in combat. It’s the perfect setup for him. Damon agrees to help, and thus, his doom is sealed! Muhahahaha!!!!!! Once Damon commits to helping, I spring my trap on him. I play the Wandering Monster card out of my hand and add GREAT CUTHULU to the combat!!!! Damon looks at me like, ‘what the heck are you DOING?!?!’. Great Cuthulu is an awesome card. 20th level, gets a +4 if there are any non-cultists fighting him. Damon is a non-cultist. Bad Stuff: you die and anyone who Cuthulu doesn’t eat gains a level to mock you. Also, your next character is automatically a cultist. So the combat is completely unwinnable. We have no choice but to run away. Now the awesome card that I had in play is a set of footgear called ‘Footgear of only having to run faster than you’. No combat bonus, but when you are in combat with another player and you run away, the boots allow you to automatically run away no matter what other card is played or power is in effect AND the other player gets a -2 to THEIR run away check!! So now Damon, who has been cursing and trapping everyone for the whole game, is in combat against 2 monsters that he cannot beat. He has a -3 to run away from The Awful Green Thing and if he fails he looses 2 levels. He also has a -2 to run away from Great Cthulhu and if the fails he’s dead AND I GAIN A LEVEL!! Damon sacrifices a sidekick to get away from The Awful Green Thing, saving his 2 levels. He has to roll a 6 at this point to get away from GreatCthulhu. Damon rolls a 2 or 3 though, so he is eaten by GreatCthulhu! I gain a level and then play the last card for my turn, a treasure card called Sole Survivor. It’s a ‘gain a level’ card BUT if you play it after successfully running away from a combat in which another player suffers bad stuff, you instead gain TWO levels! So now I’ve gained THREE LEVELS for sacrificing Damon to Great Cuthulu!! And Damon’s turn is next, which is when the last part of the Bad Stuff from Cthulhu takes effect; your next character is automatically a Cultist! Which means that my turn ends with me gaining 3 levels, Damon’s turn begins, he becomes a cultist which makes all of the players cultists and immeditaly ends the game. Since I have just gained 3 levels, I’m the highest level munchkin and I totally win!! It was just beautiful!!! Luring another player in to my combat to ‘help me’, leaving him to suffer the Bad Stuff, win in the process, all while Ken is warning him that I’m the real enemy!!! And the last monster is even GreatCthulhu!!! It was truly the most perfect example of the spirit of Munchkin that I have ever seen. I should add that this was the last or second to last hand of the game; we were about to pack it in to play our Star Wars: Saga Edition game. I don’t know if that impacted Damon’s thinking (though I’m thinking it made those treasure picks all the more attractive…). In any case, it was a great setup and a great finale. All the more so because I spent a good 2-3 minutes telling Damon not to do it because, well, BOB IS THE REAL ENEMY.